If you want an investment newsletter with easy to understand recommendations, a proven track record, and no gimmicks, then this might be the most important information you'll ever read. 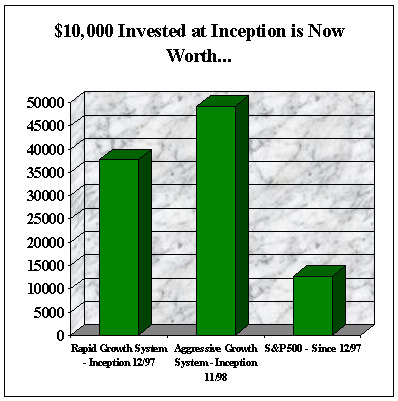 2007 is no exception, with the Aggressive Growth System up 33%, while the S&P 500's return is 8%, year to date. If you like to direct investments in part or all of your stock portfolio, and would like to get investment ideas from an investment newsletter with a documented track record of superior performance vs. the stock market as a whole, then what you are about to read could change your life. Lets face it, investing in the stock market is difficult. The average investor has been slaughtered over the past seven years - and as you've probably read, so have the "Professional" money managers running mutual funds, stock market guru's running investment advisory services, and financial advisors and stock brokers touting their latest "can't lose" stock picks. If the "Pro's" can't do it with all of the research and other information they have at their fingertips on individual stocks, industry groups, and the overall stock market, then how can a small investor succeed in the stock market? Picking stocks to invest in without a proven system doesn't work. Index funds are great for diversification, but if you had invested in the S&P 500 index 7 years ago, you are just barely breaking even today. The Growthstock Advantage Investment Newsletter has out performed the stock market over the last seven years - in fact, the Aggressive Growth system has an amazing documented track record with more than a 27% annual growth rate since it's inception. Published since 1997, the model portfolios in The Growthstock Advantage Investment Newsletter have more than tripled in value. That covers the run up in the bull market, as well as the devastation of the latest bear market. You can have access to these same legendary stock picks that many others are already receiving, to try for FREE - NO CREDIT CARD, NO OBLIGATION. We do our trading AFTER we tell you what stocks we are going to buy or sell, at the same time we recommend that subscribers following our model portfolios do their trading. Finally, we link our trade prices to images of trading statements from our low cost stock broker, so you can see for yourself that the prices we report are the prices we received. How does that compare with other investment newsletters you've researched? Investment newsletter performance - see how the Growthstock Advantage Investment Newsletter has beaten the stock market over the last ten years. Investment Newsletter - Investment advice with a track record. Sign up for the Growthstock Advantage Investment Newsletter today. The 200 day moving average is widely used by reporters to attest to the strength or weakness of the NASDAQ Composite Index - see why they are wrong. Market breadth helps determine the strength of a trend. These are up to date market breadth indicators, just click the links below to see the graphs.